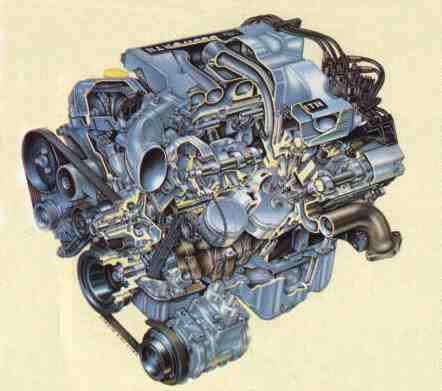 The 24-Valve Cosworth engine first appeared in the Ford Granada Mk3. It met the need for a modern V6 engine while keeping tooling costs down by using the Cologne block still manufactured by Ford (and still in production for the 12V). The engine uses quad cams driven by a single duplex chain with the four valves actuated with hydraulic tappets arranged in a pent-roof combustion chamber, with a central platinum spark plug. The new aluminium cylinder heads were made and machined by Cosworth and Mahle pistons raised the combustion ratio to 9.7 to1. The con-rods were modified, now standard for the 12V as well, while to handle the new power the crankshaft was fillet-rolled to improve stiffness and balance weights added to improve smoothness. The engine was assembled at Cosworths’ Wellingborough plant and production was planned at 7,500 engines a year. The code for this engine is FBA. Even without using variable induction systems, the 150bhp of the 12 valve was raised to 195bhp at 4,500rpm, while the torque soared from 172 fp to an impressive 203fp with standard catalyst fitted. At the time of its introduction Ford claimed that no non-turbo 3 litre could better this high torque. This unit was one of the few European engines to meet the tough 1983 Californian Exhaust Emissions standard. For the new Scorpio, detailed changes were made. In order to improve power and torque still further, a variable resonance inlet system was introduced, carrying over only the throttle body from the previous design. This is why the topside of the engine has a different appearance. 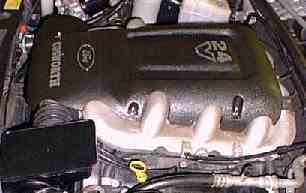 A plastic cover over the inlet manifolds hides the ‘silver octopus’. Exhaust Gas Recirculation was introduced to reduce NOx emissions on full load. The camshaft drive was changed to two simplex chains and the cylinder block and the cam cover changed to suit. Chain tensioning remains by two hydraulic units. Both cylinder heads were shortened at the rear and the sump modified. The oil filter and the thermostat housing were repositioned and newly designed exhaust manifolds and gaskets. The new engine code is BOB. The new extended EEC V engine management system with sequential multipoint fuel injection was fitted, while a second catalyst, one for each bank of cylinders, improves breathing still further. Altogether these changes raise the power from 195bhp to 206bhp at 6000rpm and torque is raised to 207fp at 4250rpm. The engine is married to a new, fully electronic automatic A4LDE gearbox. The new EEC V engine management system (Powertrain Control Module) actually controls the line pressure in the gearbox, selects the gear ratio and reduces torque while changing up to provide a smoother change.